Citation Information: J Clin Invest. 2005;115(2):313-325. https://doi.org/10.1172/JCI22433. The cytokine IL-6 acts via a specific receptor complex that consists of the membrane-bound IL-6 receptor (mIL-6R) or the soluble IL-6 receptor (sIL-6R) and glycoprotein 130 (gp130). In this study, we investigated the role of IL-6R components in asthma. We observed increased levels of sIL-6R in the airways of patients with allergic asthma as compared to those in controls. In addition, local blockade of the sIL-6R in a murine model of late-phase asthma after OVA sensitization by gp130–fraction constant led to suppression of Th2 cells in the lung. By contrast, blockade of mIL-6R induced local expansion of Foxp3-positive CD4+CD25+ Tregs with increased immunosuppressive capacities. CD4+CD25+ but not CD4+CD25– lung T cells selectively expressed the IL-6R α chain and showed IL-6–dependent STAT-3 phosphorylation. Finally, in an in vivo transfer model of asthma in immunodeficient Rag1 mice, CD4+CD25+ T cells isolated from anti–IL-6R antibody–treated mice exhibited marked immunosuppressive and antiinflammatory functions. IL-6 signaling therefore controls the balance between effector cells and Tregs in the lung by means of different receptor components. Furthermore, inhibition of IL-6 signaling emerges as a novel molecular approach for the treatment of allergic asthma. 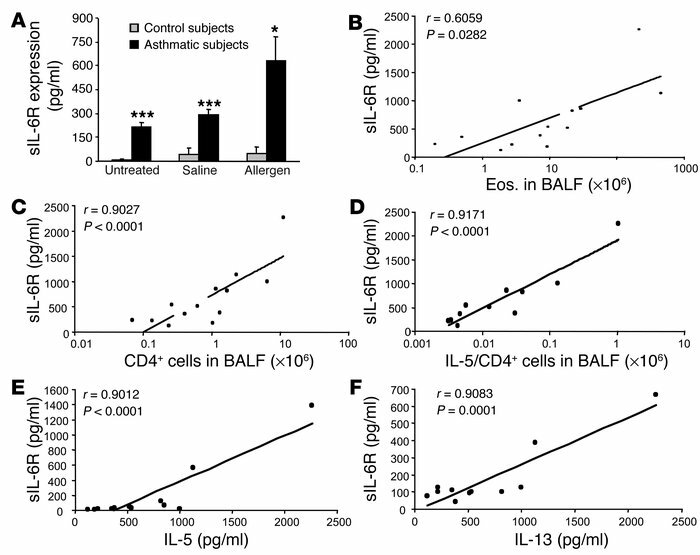 sIL-6R is increased in BALF of asthmatic patients as compared to control subjects, and its levels correlate with the number of IL-5–producing CD4+ T cells in BALF after allergen challenge. (A) sIL-6R was measured before (untreated) and 24 hours after allergen or saline challenge in control subjects (gray bars) or in subjects with asthma (black bars). In the asthmatic patients, sIL-6R levels were increased at baseline and were further increased after allergen challenge. *P < 0.05; ***P < 0.001. (B–D) In these patients, a positive correlation was found between the levels of sIL-6R and the number of CD4+ T cells (r = 0.9027; P < 0.0001) after allergen challenge (C). Furthermore, the value of sIL-6R positively correlated with the number of CD4+ T cells producing IL-5 in BALF (r = 0.9171; P = 0.0001) (D), while a lower correlation was found between sIL-6R and the number of eosinophils (Eos.) in BALF (r = 0.6059; P = 0.0282) (B). Furthermore, the value of sIL-6R in the airways of asthmatic subjects after allergen challenge correlates positively with the respective sIL-6R of IL-5 (E) and IL-13 (F) in BALF.